The Jewel of July 2018 – Community Round-Up | Azazel's Bitz Box. Ellen, from Lavender Miniature Painting and Tabletop Gaming with a miniature that is so large that it barely qualifies as such, and is also more Turquoise than Lavender, but we’ll forgive that. We have the Eidolon of Mathlann – Aspect of the Sea model from Games Workshop’s new Idoneth Deepkin (Deep Sea Elves) range for Age of Sigmar. Marouda, who (rarely) posts here on Azazel’s Bitz Box completed her first model in over a decade – Fimbrethil, Entwife by Mithril Miniatures. Hopefully she continues to put paint to brush. Krakendoom Cool’s “Horny Toad” Nurgle Helbrute. 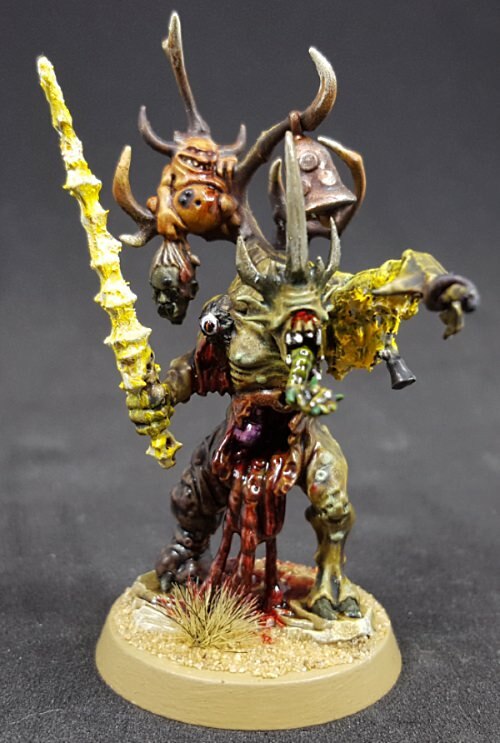 Krakendoomcool‘s Krakendoom Cool created a Nurgle Helbrute “Horny Toad” based on the trailer for the 40k PC game Inquisitor: Martyr and with Emeralds as his Jewel inspiration. Using the Boxed Helbrute as a base, along with any number of additional parts (including the venerable Space Crusade Assault Cannons). A pretty nasty piece of work! Pandora’s Bitz Box’ Norris Thing/Possessed Marine. Pandora’s Bitz Box’ Imperial Assault AT-ST.
Pandora’s Bitz Box‘ second submission is a rather impressive model in a very different way – the AT-ST from Star Wars: Imperial Assault. Warbringer’s Magni Warbringer, Techmarine of the Salamanders. Warbringer, contributor on the Krakendoomcool blog completed this Salamanders Techmarine homage to …himself! And a pretty sweet job he’s done on it, too – especially when you see the work that went into creating the model before brush met paint. Mark Morin’s Cavalry Squad of Power Armoured Frinx, riding Glyptodons. Because OF COURSE they are. Alex of Leadbaloony finished a few figures that fit the Jewel of July categories this month. Hero(?) of the Underhive, Kal Jericho and his offsider, Skab. He’s done a great job on these classics of the original Necromunda. The Imperfect Modeller’s Indiana Jones Diorama. TIM’s Kelainen Darkmantle, Evil Wizard. TIM also dipped his toe into the genre of fantasy, beginning with another Reaper model – Kelainen Darkmantle, Evil Wizard. I’m not sure if that bottle contains something magical, something really malodorous or is about to be used as a magic grenade. Perhaps all three? TIM’s third submission for the month (I know they didn’t go up in this order!) is the aptly named “Fantasy Island“. An amazing looking piece that also features a Nienna, a Reaper Elf ranger near the waterfall’s edge. 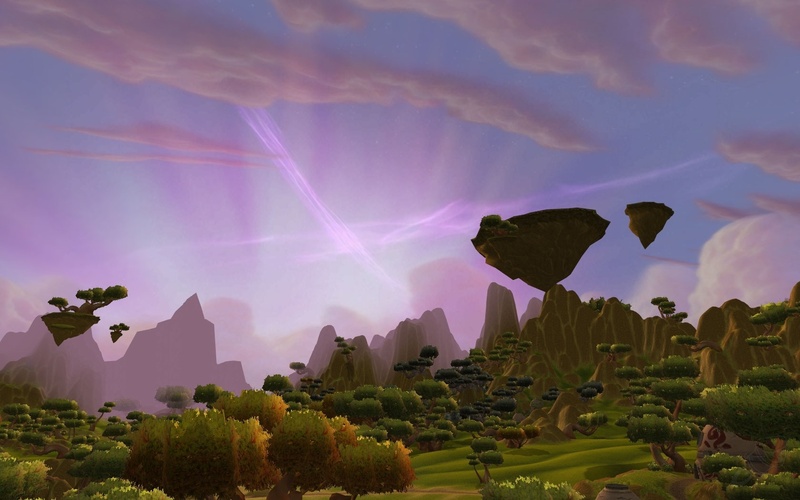 This piece conjures up images of much fantasy art through the years, but personally reminds me of Nagrand, in World of Warcraft – as it is very reminiscent of that particular lovely looking place where I spent quite some time back in the day. TIM has used quite a few new and advanced techniques to create this masterpiece – but you’ll have to visit his blog to see how he did it! 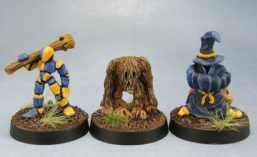 Backtothehammer has completed more than one submission this month – firstly, Garagrim Ironfist, son of Ungrim Ironfist and then in the same post, his second Wood Elf Waystalker, making the left and right hand of Haldrin Stormlight. The twin deaths. Thomas of the High Times on the Eastern Fringe has created a truly awful thing. Aramis and Skullstalker. You really need to visit (and fully read) the post to appreciate it in full. I’ll say no more here. Cousin Nalesk’s submission for the month. Cousin Nalesk from Elucubrationsursidees completed this figure, the Christmas figurine from 2006 by Freebooter Miniatures, featuring some lovely NMM on the cloak’s embroidery. This served as his contribution for Jewel of July as well as his entry to the Competition celebrating the 1,000,000th visit to The Temple of Morikun blog. Caseyrog’s Chaos Minotaur for BloodBowl. Caseyrog from Wyrd Stones and Tackle Zones completed this Forge World BloodBowl Minotaur. Mr.White’s Terrorgheist and Ghoul King. Mr.White, also from Wyrd Stones and Tackle Zones completed a Terrorgheist for July. He’s done some great conversion work incorporating Stormcast armour and shields to represent their particular delusion. Jason’s Volturnos, High King of the Deep. Finally, Jason from Wyrd Stones and Tackle Zones painted up Volturnos, High King of the Deep, for his Idoneth Deepkin army, giving us a second Sea Elf for the month’s contributions. I particularly love the transitions he’s used here on the Seahorse’s scales and underside. Wudugast from Convert or Die has turned out a rather impressive Jewel for the month. A Skaven Warp-Lighting Cannon! His ever-growing horde of WHFB Skaven now have another (centre)piece of heavy artillery to smite their foes with. Speaking of Heavy Artillery, Sfjy of Sigmund Freud is Judging You has completed the largest model yet for the month: An immense Knight Castellan. Sfjy painted the panels using the Greenstuffworld Chameleon paints, achieving those really nice, varied metallic tones on the model’s carapace. If only my challenges could motivate my own self to paint something this impressive! Just Needs Varnish’s custom Panzerjäger V Ausfuhrung A Kobra. Just Needs Varnish from his eponymous blog built and painted a custom prototype WWII Panzer. Called the Panzerjäger V Ausfuhrung A Kobra (Tank Destroyer Type 5 Mark A Cobra), he based it on a spare Panther hull, some Marder bits, and of course – plasticard. JNV also turned out another pretty cool model in July, this Brummbär that has had the skirts added from another kit. but seemed adamant that it wasn’t special enough to be considered a Jewel. I personally disagree (and I’m sure most if not all readers here would, also) – and if I’d painted it, I’d certainly be counting it. So in line with JNV’s request, it’s not officially a Jewel, it’s just visiting this post. Krautscientist from the Eternal Hunt completed an extensive conversion of a Knight Armiger, turning it renegade and creating The Hound, Enkidu Lance, XII Legion 4th Assault Company. Aside from the arms being modular, the carapace is also removable, showing the pilot inside along with his detailed console. Very cool, indeed! Argent Badger of The Bovine Overlord completed this Carrion Emissary from Malifaux – part of the Resurrectionist Crews. I don’t know much (anything) about Malifaux, but I know a cool model when I see it – and this one certainly qualifies. Argent Badger also showed off Anna Lovelace, also from Malifaux. An interesting combination of elements – steampunk, anime-bookish and also with a vicious-looking bladed tonfa. Quite the interesting contrast between the delicate pink of her top and the militaristic Battleship grey of the armoured bell-skirt. Imperial Rebel Ork’s Bruiser and Bully. Imperial Rebel Ork has submitted Bruiser and Bully, a pair of characters from his immense SkyRaiders project, more specifically from the Junkers faction. If you’d like to know more, and which one is Bruiser and which one is Bully, them I’m afraid you’ll have to click the link and let IRO explain..
Redboarwiiingers from his self-titled blog painted up this cool-looking Blood Bowl Ogre for his human team. I only happened to see the post today (Mid-August) so it’s a good example of why I need those links! Finally, my own contributions, which can be seen in slightly more detail via their individual posts over the last month, or collected in yesterday’s post. *Obviously, I’m pretty much guaranteed to have accidentally missed someone despite my best efforts, so if that’s you, please know it was unintentional – just reply to this post with a link to your model post and I’ll edit you in quicksmart. This entry was posted in Monthly Painting Challenges, Monthly Painting Round-Ups and tagged Jewel of July '18, Monthly Painting Challenge, The Jewel of July Painting Challenge. Bookmark the permalink. Such a cool collection of models this month. A few I’ve seen as they’ve been posted (I went on a bit of blog subscription bender after the last challenge), and a few I missed! So I’ll definitely have a good comb through this later to check out the other gems. Well done everyone for the contribution! People did a great job last month – really nice stuff posted up there! Great stuff. Thanks for compiling it for us. I’ve seen a few of the models but not all of them. So these round up posts really help out. The one standout contribution for this challenge must be Ellen’s Aspect of the Sea, rightfully place at the top of the list. Truly amazing. Welcome, Thomas – it takes awhile to compile, but it’s well worth it when the post is done and you get to see people’s reactions to it all in one spot! Just loved seeing them all together and some for the first time as well! And thanks for not officially mentioning my Brummbär! Brilliant paint jobs all around. Every so often I’ll turn out something pretty good but almost never anything like this. I’m inspired. Everyone has their own level and amount of experience here, so don’t feel intimidated. They’re not competitions, they’re challenges – for each of us to challenge ourselves to do whatever the theme of the month is. It’ be great to have you join in a future challenge. August might be ideal! Very welcome, Ellen. I’m in the same boat, pretty much. Still. Wow I’m blown away by all the submissions this time round. Very hard to pick a favourite but I think Pandora’s possessed Marine wins for me. Well done to everyone though. Amazing!! Thanks Az Man (Godfather of the Hobby) for putting out the challenges but also for the cool roundups. Some cracking work there- well done all. Well done everyone they all look amazing! As someone looking to dip their toes (and possibly other body parts) into Slaanesh I really appreciated Alex West’s greater daemon conversion. Also Pandora’s Bits Box’s AT-ST as it’s my favorite sci-fi vehicle of all time. Alexis, not Alex. If you have to shorten it, it’s Lexi. Sorry, I’ve just known too many people I really didn’t like who went by Alex, and it’s kind of sensitized me to that variant on my name. Probably just a muscle-memory/typo, I’m sure. – or getting your and Alex’ names confused while typing? A lot of people really brought their A-game this month. Really cool to see them all together like this. And yeah, Ellen’s Eidolon is definitely the best choice to headline. Thanks for organizing these! Very welcome, Alexis – Ellen’s contribution really shows how the right background can enhance a great model – and she’s chosen about the best background that you can for that centrepiece model! Top marks to Ellen for making us all jealous with the beach shots. Alexis for the colours in that conversion. Mark M for the sheer effort involved in those models, mind blowing. My favourite is probably Fantasy Island but it’s difficult to pick from so many great pieces. Thanks, I’m just honored to be among so many talented modelers. Really puts pressure on my game! I understand that, this community has definitely inspired me to improve my game. Going back to a model I wasn’t happy with or even highlighting, wouldn’t even have been on the cards a year or 2 ago.. The support and tips given, combined with the friendliness of everyone is second to none and that combined with the quality and uniqueness of the mini’s/posts is why I keep coming back. Ok that sounded a bit too gushy but I’m sure you get the sentiment. I like that, tho. It pushes me to accomplish things I wouldn’t otherwise have managed. I probably would have just called my KoS done without the last layer of highlights if it hadn’t been for this, and I’m really glad I did, because the results were totally worth the effort. Very true and I feel the same way. Most welcome mate – there’s so many standouts this last month! Great round up and really appreciate the work you put into this. Even when I am unable to contribute for one reason or another it is great to see what others are up to. Fantastic work all round. Wow, what a post. Well done to everyone who took part in this challenge, and to Azazel for bringing us all together from around the world. It’s hard to pick favourites, but I think I’d have to give the top two to the Eidolon and the Keeper of Secrets; both fitting jewels for July. Amazing see all these minis in one big post (thanks Azazel!). I see a lot of good effort went into these, with several people pushing their painting skills. Truly amazing that some people cranked out not just one jewel, but several! Awesome work all around! Hoping to see you in the next one. And the one after that, and…. Thanks man, I might be slow, but I’ll get there eventually. Yeah, it’s nice to see such variety of games and genres. As much as I love 40k, it’d have a bit too much sameness if it were only people’s painted space marine models or something like that (just a bit, though! 😉 ) No problem on the squads, Mark – I did the same thing with the undead golem-ogre-thingies! Yeah, saw that. Of course I play squads and platoons so units are mostly what I do, though hoping to stretch myself in August! 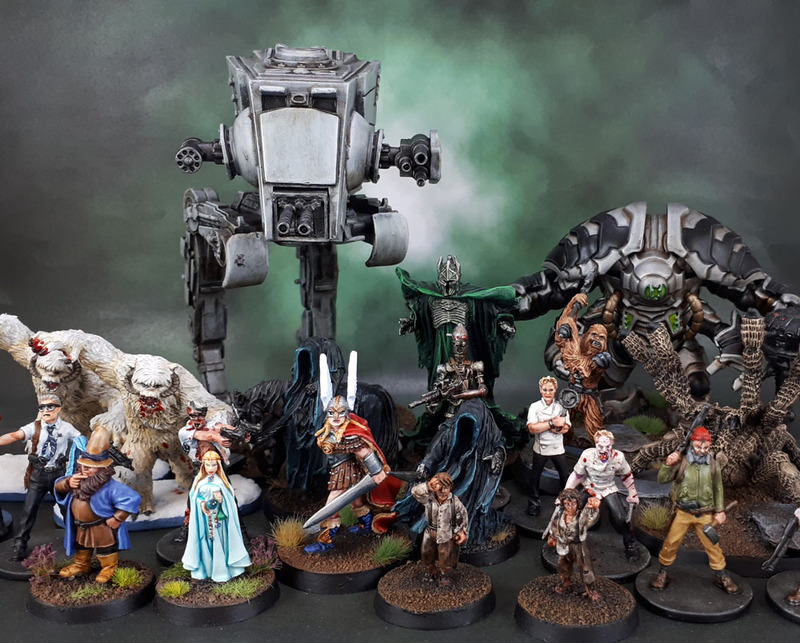 An impressive collection of wonderful paintjobs. Awesome community project! Indeed. Easily one of the best months so far! Wow! I’m blown away by the standard of work and selection of models, great effort everyone. Yep, people did a great job!